The felt hat industry has been traced to the mid 17th century in France, and it was probably introduced into England some time around 1830. A story passed down in the hat industry gives this account of how mercury came to be used in the process: In Turkey camel hair was used for felt material, and it was discovered that the felting process was speeded up if the fibers were moistened with camel urine. It is said that in France workmen used their own urine, but one particular workman seemed consistently to produce a superior felt. This person was being treated with a mercury compound for syphilis, and an association was made between mercury treatment of the fibers and an improved felt. Eventually the use of solutions of mercuric nitratewas widespread in the felt industry, and mercury poisoning became endemic. (reference) Dementia and erethism were indeed a common ailment among 19th Century hatmakers. But Lewis Carroll did not invent the phrase, although he did create the character. 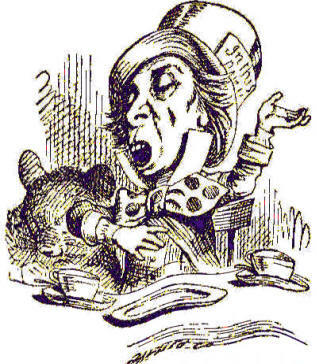 The phrases 'mad as a hatter' and "mad as a March hare" were common at the time Lewis Carroll wrote (1865 was the first publication date of Alice). The phrase had been in common use in 1837, almost 30 years earlier. Lewis Carroll frequently used common expressions, songs, nursery rhymes, etc., as the basis for characters in his stories. The origin of the phrase, it's believed, is that hatters really did go mad. The chemicals used in hat-making included mercurous nitrate, used in curing felt. Prolonged exposure to the mercury vapors caused mercury poisoning. Victims developed severe and uncontrollable muscular tremors and twitching limbs, called 'hatter's shakes'; other symptoms included distorted vision and confused speech. Advanced cases developed hallucinations and other psychotic symptoms. Danbury, Connecticut, an important center of America’s hat-making industry until men's hats went out of fashion in the 1960's, developed its own reputation for madness. Regionally, the "Danbury shakes" were a commonly recognized series of ailments. On December 1, 1941 the United States Public Health Service banned the use of mercury in the felt industry in this country. Although it has been suggested that the expression 'mad as a hatter' and the character portrayed in Lewis Carroll's Alice in Wonderland may have other origins other than mercurialism among hatters, few can resist making this apocryphal analogy. Many hatters with long-term exposure, particularly those involved in carroting, got mercury poisoning. Mercury poisoning attacks the nervous system, causing drooling, hair loss, uncontrollable muscle twitching, a lurching gait, and difficulties in talking and thinking clearly. Stumbling about in a confused state with slurred speech and trembling hands, affected hatters were sometimes mistaken for drunks. The ailment became known as "The Danbury Shakes". In very severe cases, they experienced hallucinations. Synonyms and related keywords: mad hatter's syndrome, metal fume fever, Minamata disease, methylmercury, methyl mercury, mercury poisoning, mercury toxicity, mercury-induced cognitive impairments, mercury intoxication, mercury exposure, prenatal mercury exposure. Acute mercury exposure has given rise to psychotic reactions characterized by delirium, hallucinations, and suicidal tendency. Occupational exposure has resulted in erethism, with irritability, excitability, excessive shyness, and insomniaas the principal features of a broad-ranging functional disturbance. With continuing exposure, a fine tremor develops, initially involving the hands and later spreading to the eyelids, lips, and tongue, causing violent muscular spasms in the most severe cases. The tremor is reflected in the handwriting which has a characteristic appearance. In milder cases, erethism and tremor regress slowly over a period of years following removal from exposure. Decreased nerve conduction velocity in mercury-exposed workers has been demonstrated. Long-term, low-level exposure has been found to be associated with less pronounced symptoms of erethism, characterized by fatigue, irritability, loss of memory, vivid dreams, and depression WHO, 1976).